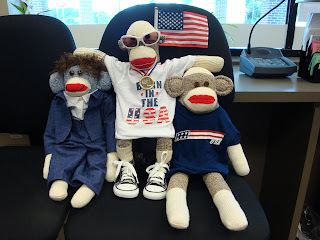 I couldn't think of a better way to spend Sock Monkey Friday at the bank than with my pals, President Basock Obama (left) and Billy Ground Hog (right). We are the Patriotic Posse! I decided to wear my gold medal from my victory in the monkathon at last summer's Olympics in Beijing. 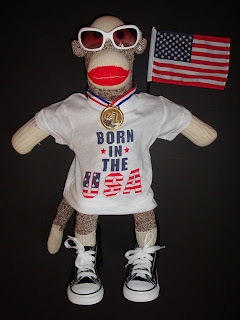 I was born in the USA... and proud of it! 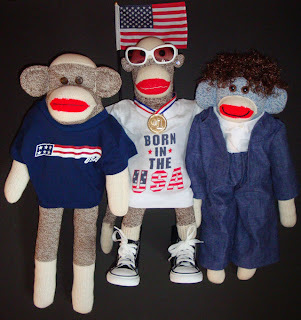 The Patriotic Posse wishes you a fantastic Fourth of July filled with food, fireworks and fun!